• The product idea is very innovative. It uses the mobile phone to charge and backup automatically while charging it is an offline and effortless way to free up space on iPhone. • Product is easy to use, no need to open the APP, do not unlock, start charging, unplug the end, quite user friendly products. • It acquired Apple MFi certification and its USB Role Switch holds patented chip technology in many countries. • The target market is clear; first start from Apple's IOS system, and then cut into the British and Australian markets. • The price is NT$1,680. It is quite reasonable and the number of pre-orders is as high as 5,000. The future market has excellent potential. It is a creative, innovative, good design quality, and user friendly product. • The price NT$1,680. It is quite reasonable and the number of pre-orders is as high as 5,000. The future market has excellent potential. It is a creative, innovative, good design quality, and user friendly product. 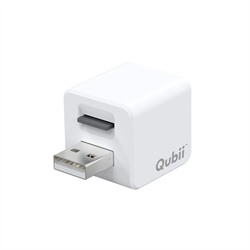 Despite having the size, shape and color of a marshmallow, Qubii simultaneously performs auto backups while charging an iPhone or iPad. Qubii performs the dual roles of auto backup of critical iOS and iCloud device photos, videos, social media and contact information while also SIMULTANEOUSLY charging the device.